The Rexel Apollo staples up to 180 sheets of 80gsm paper. 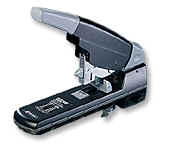 A powerful hand operated stapler made of durable die cast metal. Uses No. 23 Staples in various leg lengths. Adjustable paper depth guide. Rear Staple loading.